"Dr. Arroyo, Dr. Q, and staff are great! Highly recommend." "My family and I always receive excellent care. I highly recommend." "Dr. Arroyo is a great doctor--she takes her time and is thorough with her patients." "Clean, friendly, and efficient office." "Lovely staff and Doctor... easy to make an appointment and convenient location." "Dr. Arroyo is fabulous; smart and thorough and direct and fast and kind." "Both locations, the one in Libertyville as well as the one in Gurnee are good." "Love the entire office! I took my daughter here and appreciated the staff..."
Founded by Dr. Martha Arroyo, M.D., Ph.D, FAAD, Lakeside Dermatology is a state-of-the-art dermatology practice offering adults and children the highest level of care for conditions affecting the hair, skin, and nails. Lakeside Dermatology offices serve patients in Libertyville and Gurnee, Illinois. 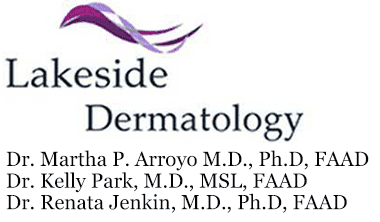 Lakeside Dermatology provides a full suite of dermatologic services including general dermatology, cosmetic dermatology, pediatric dermatology and Mohs Micrographic Surgery. Our providers treat all common skin concerns, including acne, eczema, psoriasis, rosacea, warts, and moles. In addition, topical medications, microdermabrasion, light therapy, and laser treatments are employed to improve the symptoms and appearance of common dermatological conditions. Lakeside Dermatology also provides an extensive line of customized skin and hair products available for patients for use at home. Brighter is better. Get back to your youthful glow! Our laser treatments are made to renew your skin. Click to learn more!